Didn’t the NFL fine players for over-zealous touchdown celebrations through last season? Weren’t those demonstrations of glee protected “free-speech”? If not, why not? What if a player wants to wear a 49’ers jersey while freely and publicly endorsing a political candidate? OK by the 49’ers? The NFL? What if a player wanted to sew a Cross onto the front of their playing jersey, or put a Jesus decal on their helmet for game-time? OK with the NFL? Personally, I think the President should stay out of these things, but I myself am a little mystified regarding what seem to be dramatic inconsistencies within what the NFL recently fined and now appears to fully support. The National Anthem represents all of us, and especially those who died enabling us to sing it. It has nothing to do with a sitting President (as these protests began during the previous administration). It’s bigger than that. It’s bigger than party or team, or individual. That’s why it’s respectfully rendered before many games across many sports. How is it that some, wearing an NFL uniform, will take a knee during our National Anthem, while taking a big check that uniform, and thriving in our country, provides? How was aggressively spiking the football last year more of a concern to the NFL than actively disrespecting the National Anthem was and is today? One of my favorite things to do is take time off, not only to decompress, but also re-vision my sense of self, my calling, and my God. Stepping away from daily pursuits offers valuable perspective, and there’s a reason why the One Who called a Universe into being, commanded us to take regular rest. Over a period of three weeks, I watched very little news. What a blessing that was, as the world went on without my scrutiny, and, in reality, what I was doing in life was just as relevant as what I might find on TV. As a former broadcast journalist, I’ve always known this, but still it’s easy to fall into the trap of thinking we have some kind of holy obligation to attend to what is printed in the New York Times. Do we feel the same way about opening up and reading the Scripture? Or is it perhaps that we deem the message in the Bible less relevant or current. 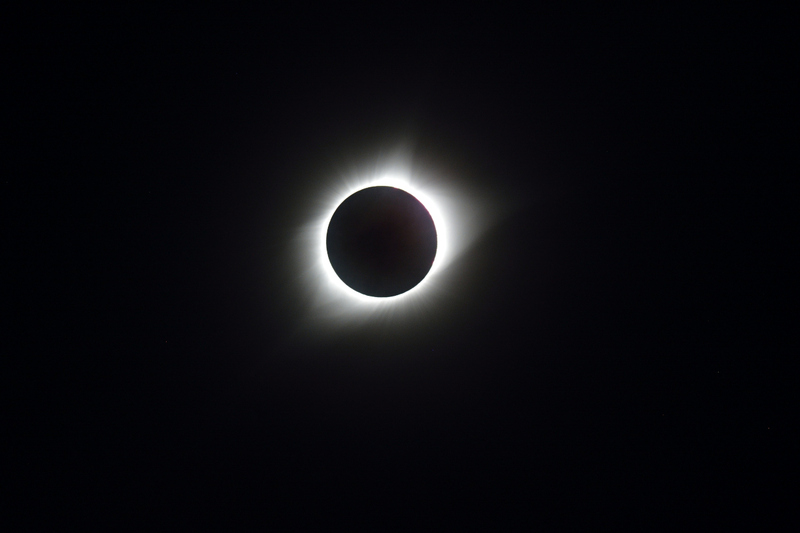 With encouragement from Lisa and Niue, I did some internet gymnastics, and wound up economically ensconced in Kearney, Nebraska, perchance to see and photograph the 2017 total solar eclipse. Some locales were mobbed, but on the big day, I found myself resplendently emplaced on a wide expanse of emerald green grass within in the Mormon Island State Recreation Area. Truth is, I found it a bit by accident, just off I-80, en-route to somewhere else. As I’ve said to my kids, have a plan, but be open to what unfolds. Instead of being in a stadium or field of thousands, I was able to make instant friends with 15 or 20 nearby souls, who’d come in from all directions and persuasions, in all manner of transport, for a totality climax set to last more than 2.5 minutes. We were literally going to be “made in the shade”! Trusty Mylar and cardboard filter in front of my eyes (and one for the camera) during the partial phases, the clock ticked down as the Moon soared through space to provide the ultimately defining moment. Then, it happened. It clicked in. No announcer to tell us what was occurring, no media outlet spinning the event. Just one sphere perfectly interposing itself 400X closer over a fiery orb 400X bigger. Rather straightforward. Yet, in our neck of the galaxy, incredibly rare. Maybe that’s why folks spontaneously shouted and screamed. Some cried too. Glasses off, it was a sight to behold. In totality, the corona was made visible and iridescent prominences revealed the radiation that gives us life. Looking up to an actual event that takes us beyond ourselves, people become one. Left, right and center, as the temperature dramatically drops, humans are lifted up and unified in seeing the light and darkness that define our being. Total eclipses are celebrations of a star, 13 billion years in the making, that supplies 99% of our planet’s heat. That reality becomes rapidly obvious as the temperature drops precipitously with the suddenly imminent dusk. Some might see our “yellow dwarf” eminently stable star as an accident. My guts and my belief tell me it’s part of an act in the only play that matters. It is but one expression among many millions and billions of cause and effect events that enable you and I to see, consider, and celebrate. Solar eclipses fall upon the weak and the strong, the rich and poor, the black and white, the serious and silly. Clouds be willing, they call us to look up, and far, far away from ourselves. I believe, when the Moon, in its very special place, flawlessly interposes itself in front of our Sun, it is a little reminder from the Word, Who perfectly and precisely called us into being, to rise above our petty divisions. Thus we will see ourselves as most fortunate people, who are, whether by faith, or simple fact, sisters and brothers on a blessed Earth. You are currently browsing the BillKeane Perceptions blog archives for September, 2017.